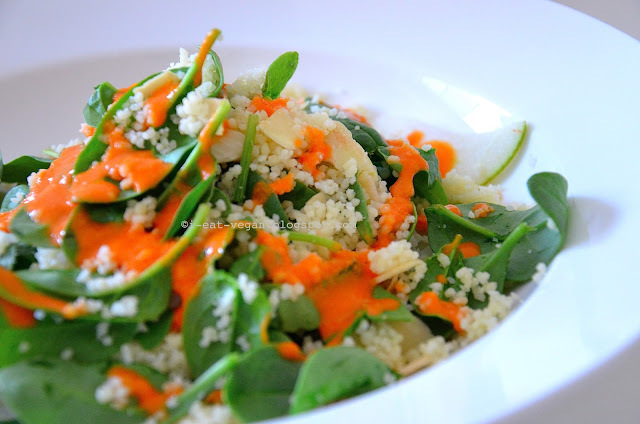 continuing to work my way through my growing vegan cookbook collection, i threw together isa chandra's catalan cous cous salad with pears and amazingly delicious romesco dressing. cous cous is so simple to prepare, slicing a crisp pear takes seconds and blitzing up the dressing will be done in minutes. as quick as this fab meal comes together it will dissapear off your plate - an absolute winner! this is the second recipe i have attempted from isa chandra's appetite for reduction and i am really loving this book! the recipes are low-fat (excellent! ), the ingredients are stock-standard in a moderately established vegan pantry, it takes no time at all to have a really special looking dish on the table, and 2 out of 2 have been really, really, really satisfying and tasty.